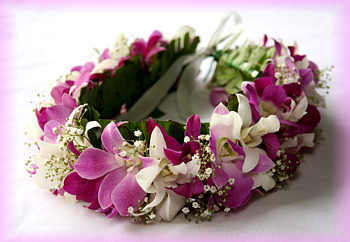 Meant to be worn on the head. 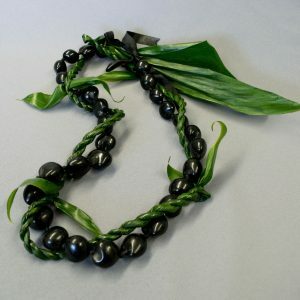 Originally this lei was a special order variation of the white wedding haku, but we liked it so much we added it to the regular line of haku leis. 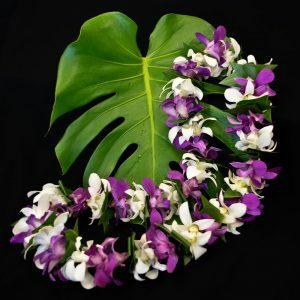 White, purple, and lavender dendrobium orchids with baby's breath on a fern leaf backing, finished with ribbon ties. 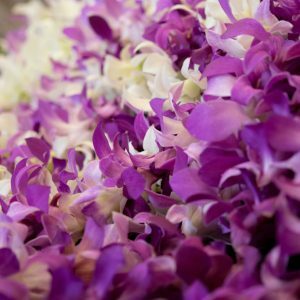 Haku refers to the method of securing the flowers and foliage "presentation style" to the base of the lei. Must be ordered a week in advance.